Time taken to knit: May 24th – June 8th 2008. Yarn: 100g of Bergère de France Cho’7 (Ravelry link) in J6499. Modifications: As usual I didn’t stick to the pattern 100%. 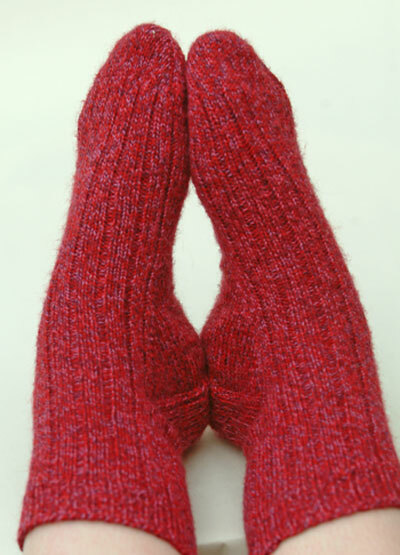 They were knitted two at a time & I changed the toe to make it rounder & blunter. 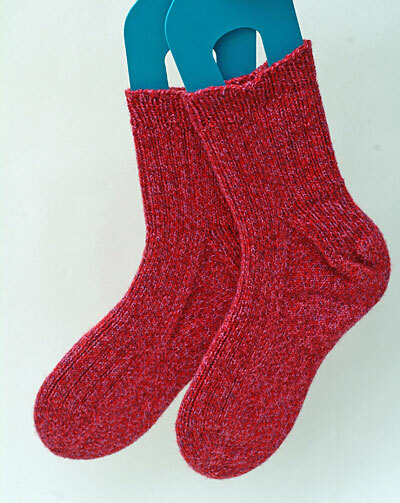 I worked a 3×1 rib so that I could concentrate on the construction of the sock. This yarn doesn’t have a fantastic yardage as it’s between a 4ply & DK weight but 100g gave me a short pair of socks which are perfect for wearing with walking boots or trainers in the spring & summer. I really like this yarn & would be very happy to use it again. Now I thought that my Pink Flamingos were comfortable but these have beaten them hands down. It’s the first time I’ve used negative ease & I’m a convert. ETA: NovaKnitter asked about Negative Ease. Hopefully this link will explain it fully. >They are lovely! I shall never see your socks again without thinking of contortions!! >Your socks are lovely, but I have a question…..What is negative ease? >Fab socks. I do my heel on toe ups like that I think or at least it looks the same. >Nice socks. The yarn looks scrummy. I love a bit of negative ease for a truly comfy fit. The only toe-up heel flap I’ve tried is the one from New Pathways, but I’ll have to check out that link you gave.